Ad Stuffer Version 1.0 – Stuff your ClassiPress with Ads. 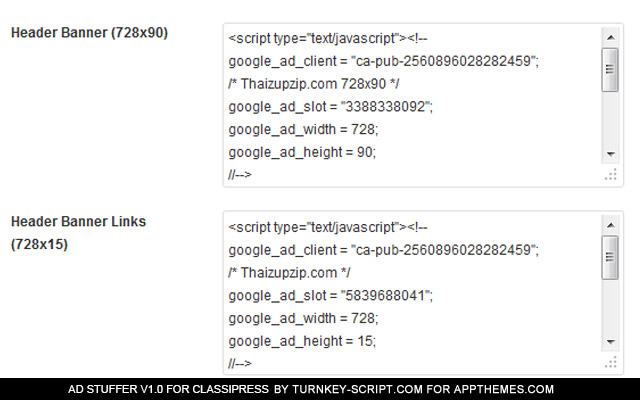 With Ad Stuffer you get two extra Adsense Links and three extra ads for a total of five extra ads. 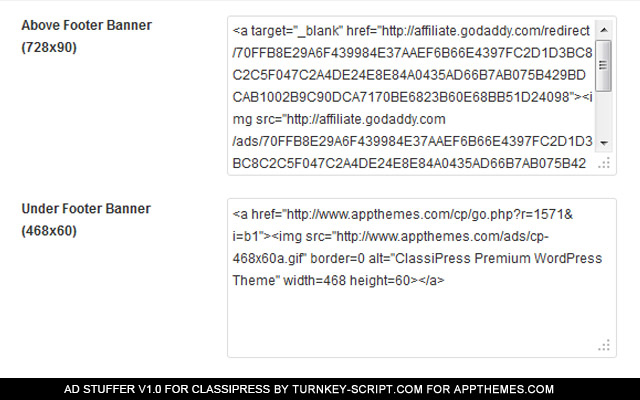 Ad Stuffer will also take over your footer and you can put a total of four links for example a link to the AppThemes Affiliate market place. You are free to mix ads and links as you please but the total links and links are nine. 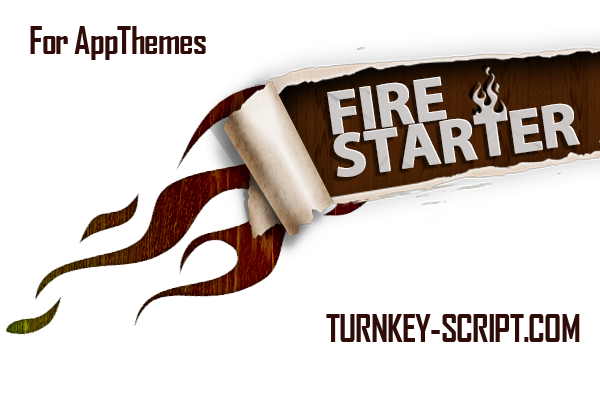 $$$ Promotion $$$ – Buy now and get free – Ad Stuffer for all AppThemes that will launch in December 2012. – Maximise your Ad revenue! Show 9 more ads & links on your website! 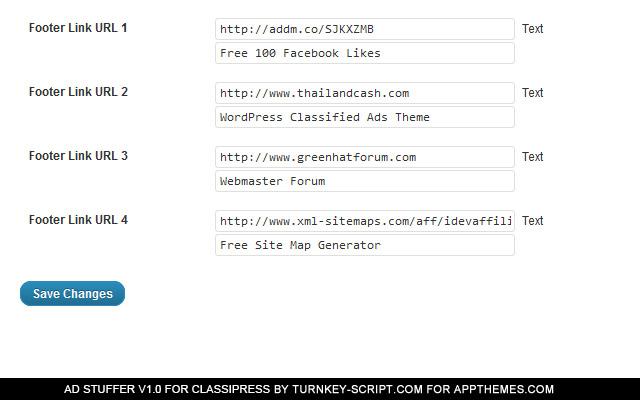 – Easy installation with FTP or WordPress admin in your ClassiPress based website. – No need for Child theme or hire webmaster! – Easy install like turning a key! 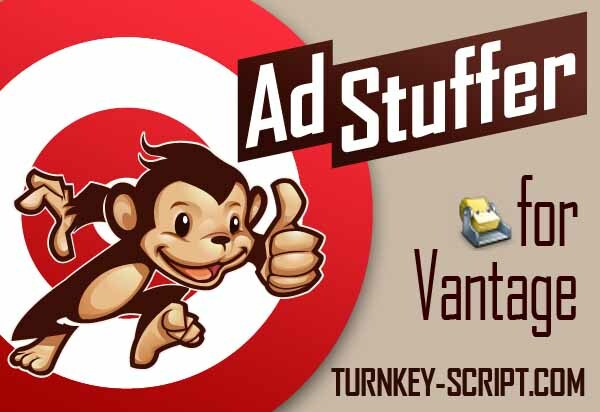 Install the Ad Stuffer by FTP or from WordPress Admin. Activate Ad Stuffer from inside the WordPress Admin panel. 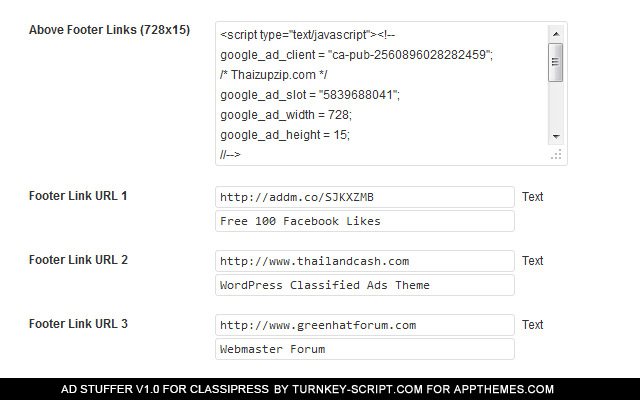 Put your Adsense, php, iframe or java code inside the Ad Stuffer. You find Ad Stuffer under settings in your WordPress Admin. The support des not exist at all – no help at all.. i reported issues about footer urls that are not showing on forum and it was no answer. 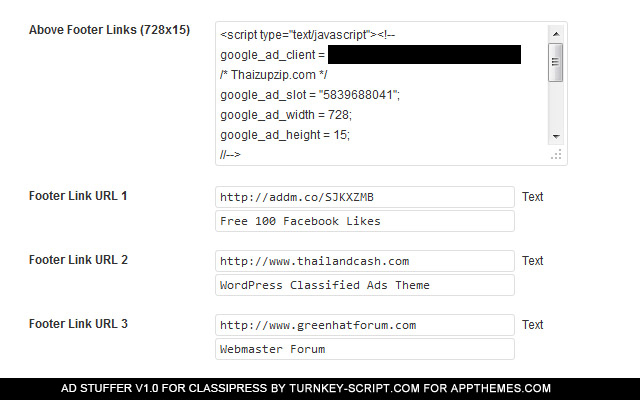 the plugin destroys the mobile version of classipress!!! the idea of this plugin is good but implementation is not good at all!! 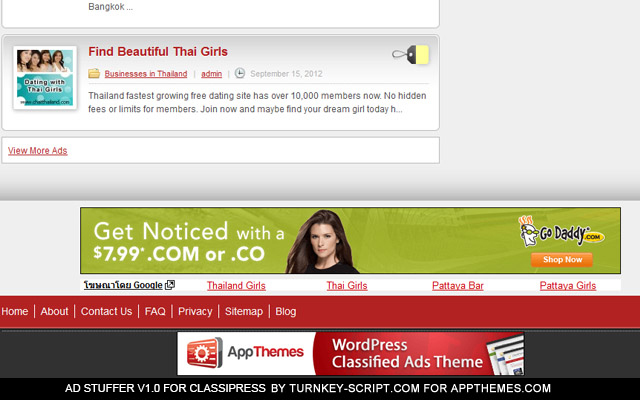 By the way ,how can insert advertisement in ads? I need some instructions on how to use this plugin once added to classipress. Well, i’ve started a thread concerning my question in the forum…would be expecting your feedback…. Hi there, any chance of this coming to the vantage theme – because the vantage theme is really lacking on ad space. Yes we are working on that, Jobroller is on the way. Any update on when this will be available for Vantage? Does this add-on give statistics when the ad is clicked on? Companies who pay for advertising will want the statistics for there adverts.